ORDER ONLINE Great news! We have partnered with www.eatsy.co.uk (the Bristol based food and drink marketplace) to enable everyone to order online from us. Which means you can now order collection or delivery directly from your phone. We serve an excellent selection of Chinese meals from our extensive menu to take-away, collect or to be delivered at your door. 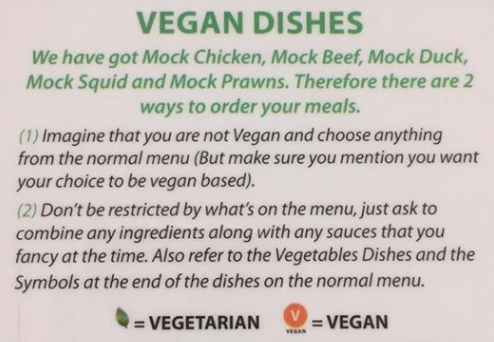 We have got mock chicken, mock beef, mock duck, mock squid, and mock prawns. Therefore there are two ways you can order your meals. (1) Imagine you are not vegan and choose anything from the menu (but make sure you mention you want your choice to be vegan based). (2) Don’t be restricted by what’s on the menu, just ask to combine any ingredients along with any sauces that you fancy at the time. Also refer to the vegetable dishes and the symbols at the end of the dishes on the menu. If your party is greater than 4 people, please speak to me and I will help you to set up your tailored made set meals.